As a nation, we are riddled with depression and addiction. Hate groups march openly in our streets. School shootings are a frequent occurrence. We imprison people at shocking rates. We wage unwinnable wars against unseen enemies. We willfully poison our land, air and water. We don’t believe a thing we say, and it doesn’t seem to matter. Who’s running this place, anyway? 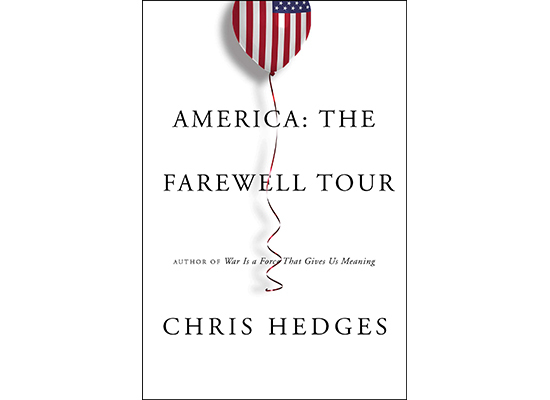 Not us, says Chris Hedges, the Pulitzer Prize-winning journalist whose new book, “America: The Farewell Tour,” provides a scathing – and urgent – critique of the dire consequences of our nation’s unfettered capitalism. As the title suggests, Hedges’ book explores the final throes of our corporate empire, indicative of famously failed empires gone before, and the pathologies it manifests. Hedges traveled the country, researching this book, but his view of America is refined also by nearly two decades as a foreign correspondent in Central America, the Middle East, Africa and the Balkans. He has reported for The Christian Science Monitor, National Public Radio, The Dallas Morning News and The New York Times. Hedges currently writes a weekly column for the website Truthdig and hosts “On Contact” on the Russian government-funded network RT America. And as if that weren’t enough, he also teaches a class in prison through Rutgers University in New Jersey and is an ordained Presbyterian minister. Hedges visited Portland in recent weeks to promote his new book and to be the featured speaker for “Democracy Reborn: Communities Resisting. Communities Rising,” an event by Oregon Community Rights Network. During his latest visit, he stopped by Street Roots to chat with vendors about their experiences with homelessness, which he wrote about in a Truthdig column. Street Roots talked with him over breakfast on Oct. 2, and while he spoke calmly and clinically about America’s crises, Hedges stated frankly that he is genuinely scared – for himself, his family and the planet. And we should be too. Because the problem is bigger than one or even both political parties. This cancer is rooted in our hallowed political and economic systems. And Charlottesville, Kavanaugh and Trump? Those are just the symptoms. 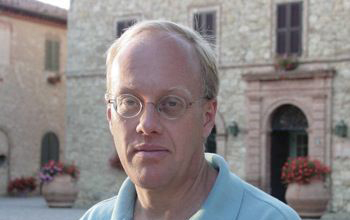 Chris Hedges: What’s going on is that the social bonds that make a healthy society possible have been broken. And until those bonds are repaired, things are only going to get worse. And we see a myriad of symptoms – chronic underemployment and unemployment, homelessness, opioid addictions, a retreat into gambling, suicide, hate groups – we must remember that people who seek to destroy others are driven from a deep desire to annihilate themselves and everything that makes an open society. It’s what the socialist Emile Durkheim called “anomie.” The literal translation of anomie is rulelessness. It means the rules don’t work anymore, at least the rules as they’re presented to society. What are those rules? You work hard, you get a good education, you obey the law, and you get a chance to carve out a meaningful existence with a living wage. That’s gone. There are two sets of rules. There’s one set of rules for us, where we have criminalized poverty, created the most monstrous system of mass incarceration in the industrialized world, where wages have remained stagnant. American productivity since 1973 has increased by 77 percent, and if wages had kept pace with productivity, workers would be earning more than $20 an hour. Instead, over 41 million American workers – a third of the workforce – earn less than $12 an hour without employee-sponsored health insurance. The capture of the economy by speculators, the deindustrialization of the country, the militarization of the police, and as we just saw in Portland, the lethal shooting of another American; 3.1 Americans are shot by police every day in the streets of American cities. In most cases, they’re unarmed. The stripping away of basic civil liberties, including due process. The trashing of the economy by the oligarchs who have in essence orchestrated a tax boycott: The highest rates of taxation for the wealthiest individuals and corporations under Eisenhower was 91 percent. Now large corporations like Bank of America don’t even pay taxes, and this is while they essentially absolve themselves from all social responsibility, basically distorting all institutions and mechanisms of government to further consolidate their own power and amass greater wealth. As they do that, it becomes more and more punishing on the working class because they extract revenues from the most vulnerable. So you have counties like St. Louis (Ill.) County; they depend, for 30 or 40 percent of their budget, on fines. It’s just made-up crimes. Carrying an open container, not mowing your lawn – that’s a fine in St. Louis County. Obstructing pedestrian traffic, which means standing too long on a sidewalk. Selling loose cigarettes, for which Eric Garner was killed. And if we don’t address that anomie – the breaking of those social bonds – it doesn’t really matter who’s in office. You can get rid of Trump; it won’t make any difference. And of course we’re not talking about it because the corporate forces that profit from that, and who see all mechanisms to create social solidarity as an impediment to profit, have complete control over the airwaves, academia (and) the two major political parties. And so the gravest social crisis is not discussed, along with the gravest existential crisis, which is climate change. Joanne Zuhl: You say it doesn’t matter who’s in office. We’re coming up to an election, and a lot of people are looking forward to the vote as a way to flip the House and/or Senate. Is that just theater in your opinion? Is the election going to make any difference? C.H. : No, it’s not going to make any difference. There’s complete continuity on all of these issues no matter who’s in office. In fact, the assault on civil liberties by Barack Obama was worse. He deported 4 million people. Arne Duncan (education secretary, 2009-15) was not privatizing and creating charter schools at quite the pace that (current Education Secretary Betsy) DeVos was, but these precedents were set. You have one corporate party, and on one end you have troglodytes like the Sheldon Adelsons, the Mercers and Trump, who are unrepentant racists and bigots and Islamaphobes. And on the other end, you have Silicon Valley (types). They don’t want to be painted as homophobic or racist or Islamaphobic, but on all the structural issues, there’s zero difference. And it’s the structural issues that are destroying us, including destroying the ecosystem on which we depend for life. So how do you want to take your poison? In the classy, well-mannered posture of a Barack Obama, or the crude manner of a Donald Trump? We are on the cusp of another economic meltdown; they have, since 2008, created $26 trillion out of electronic ether. They didn’t invest it in the economy. They gambled with it. They bought back their own stock because their compensation packages are tied to it. And they hoarded it. And this time around, when this – Marx calls it “fictitious capital” – when this bubble bursts, they don’t have a Plan B. They can’t lower interest rates any more than they’ve (already) lowered them. We will see even more egregious and naked forms of police repression, a further assault on the most basic civil liberties, including due process. All the things that poor people already experience will become more pronounced throughout the wider society. These tax cuts will erase – over 10 years – $1.5 trillion from the federal budget. Next year, we’re on track to pay just over $300 billion just on government debt on interest. Within 10 years, that will rise to $900 billion just on interest. It’s not a sustainable financial system. So we’ve undergone a corporate coup d’etat in slow motion, and these people are just pillaging and destroying the country. And anybody who is poor understands: We don’t live in a democratic state. It’s fictitious. We’re watching it with the Kavanaugh hearing. It’s just political theater. The judicial process is political theater. The legislative process is political theater. It’s become tribal. People don’t care about truth; they don’t care about justice. We are no longer a society rooted in verifiable fact. It’s all of the hallmarks of an emerging totalitarian system. And nobody’s even raising the issue. They’re all sitting around watching Stormy Daniels. J.Z. : You have talked about Standing Rock – the protest against the Dakota Access Pipeline near the Standing Rock Indian Reservation in South Dakota – as something we should be paying attention to and learning from. Why Standing Rock in particular? C.H. : Standing Rock’s important because it was an act of sustained mass civil disobedience, very rooted in a spiritual understanding of the sacred. It was led by indigenous communities. You can always tell when the state is worried because they respond with draconian force. So the Women’s March in Washington, they couldn’t care less. But when you obstruct their ability to make money – in this case trying to block a pipeline – then they react viciously as they did. Attack dogs on the crowds, over 700 arrests, constant infiltration and surveillance, hosing protesters down with water cannons laced with pepper spray in sub-zero temperatures. And that’s the kind of resistance we have to mount if we’re going to save ourselves, because it’s only going to get worse. It’s probably going to get much worse. Everyone has to organize, including the homeless. I know it’s hard, because of all of the stresses of being homeless. Life’s one long emergency when you’re living on the street, and it takes a physical toll that’s debilitating. But everyone has to rise up. If we don’t take over this system and we don’t overthrow it fast, climate change alone will extinguish the human species. One of the reasons climate scientists are so frightened of going above 2 degrees Celsius is because of feedback loops. In essence the degradation of the biosphere becomes so pronounced that there’s nothing you can do to stop it. And we know what feedback loops do because they’ve studied it on planets like Venus, which once had water and is now 800 degrees. Were just not responding. We’re entranced by these electronic hallucinations fed to us by corporate power. J.Z. : There are multiple movements – #MeToo, Black Lives Matter, and we had Colin Kaepernick, who turned the NFL on its ear for a while. What are your thoughts on these efforts? C.H. : Those movements, I support them, but they’ve got to be tied to economic structures, which they’re not. There are segments of corporate power that are quite comfortable with identity politics, multiculturalism and diversity, as long as those who come from that community serve the system. So neo-liberalism as an ideology is about radical individualism; it’s about destroying communal structures that make it possible to resist. There’s a large segment of the corporate capitalism that are quite comfortable with the Me Too movement, or diversity, as long as it doesn’t include a critique of the systems themselves. Radical individualism is not a positive force. Because it elevates the cult of the self and promotes the idea that your identity and your interests are paramount to everyone around you. And the corporate state is comfortable with that; that doesn’t bother them. So I certainly support Black Lives Matter and I support all these groups, but I worry that they’re not addressing the structural issues. What will happen with a societal breakdown – and I saw it in Yugoslavia when I covered the war – you will get demagogues like Trump who will essentially green-light violent attacks against the “other,” including, of course, the poor, but also African-Americans, Muslims, undocumented workers, as a way of channeling this inchoate rage toward the vulnerable. As if 12 million undocumented workers are somehow responsible for our economic decline. It’s absurd. It’s just ridiculous, but it works. You’re already seeing it in the rhetoric of Trump. J.Z. : You’ve also spoken about teaching in prison, that people who were incarcerated taught you possibly more about resistance than anything else. C.H. : In terms of prison, we have 25 percent of the world’s prison population because when you deindustrialize those urban centers, the only way most of the people could make a living was in an illegal economy, which means their poverty became criminalized. And you lock these people up as a form of social control. You lock the men up – I mean, you lock the women up too, but it’s disproportionately poor men of color. And what you do to the women and children is evict them every six months so they can’t build any community or network to resist. It’s why when you visit an incarcerated relative in prison, it’s so unpleasant. They make it unpleasant, especially for the children. They don’t want people to build any network in which they can confront these forces. Because we can’t confront them alone. You have a group of very serious and impressive people who find whatever freedom they can find in prison through the life of the mind. And I’ve watched them carry out acts of resistance in prison. One of my classes led a sit-down strike in the prison, and it was moving because they knew what was going to happen, which did happen, which was everybody had their cells searched, everybody was interrogated, and you’re threatened with losing what little you have in prison: the ability to be in the education program, your rec time, your job. Until they found the two leaders, and they sent them to another prison, and they’re in indefinite solitary confinement. Everybody knew (what would happen), but they rose up and resisted anyway. And that for me was instructive. That’s what we have to do. We have to stop asking ourselves if we’re going to succeed, because if we don’t rise up, we’re definitely not going to succeed. And at the same time we have to be very conscious of the forces that are raised against us. I think the greatest existential crisis of our time is to at once grasp what it is we have to confront, and yet resist anyway. And I see that in the prison. J.Z. : Do you support a civil war? C.H. : Civil war? No. No. 1, because violence is the language the state can speak far better than we can. No. 2, it won’t work. I mean, the state wants it. They love the Black Block, or Antifa. It’s a gift from heaven because it demonizes the movement and makes people frightened of it. That’s the basic goal of any counterinsurgency. I mean, the whole idea of throwing bricks through windows? Look, I’ve covered war. I know what special forces are equipped with and what they can do, and this is insane. Revolution is not a form of catharsis. I support a revolution, but we won’t win if we deploy violence. Any revolutionary movement succeeds by appealing to certain elements within structures of power and getting them to defect. That’s what I saw in Eastern Europe, when I covered the revolutions in East Germany, Czechoslovakia and Romania. And what all the theorists like Crane Brinton (“The Anatomy of Revolution”) and others have written that that’s the only way revolution succeeds. And the system is so corrupt, so gamed, so rigged, so rotten that we have the capacity to appeal to those forces successfully. That’s our only hope. Because at this point, unfettered, unregulated capitalism with no internal or external constraints will commodify everything. Human beings in their eyes are commodities; the natural world is a commodity that it exploits until exhaustion or collapse. And there’s nothing now within the structure of power that will stop that. J.Z. : You talk about appealing to people for the revolution. But it feels like they’ve already cut us off on that front, including gutting net neutrality. For example, we as an organization can’t promote most of our news stories on Facebook because its algorithm categorizes them as political ads and won’t let us do it. So it feels like that reach has been shut down. C.H. : It is being shut down. Nobody’s buying the ruling ideology, which is neo-liberalism – the idea that you structure your society around the dictates of the marketplace – and that’s across the political spectrum. So they are going after the critics, such as myself, who has already been pushed to the margins of this society, because they don’t have a counter argument. So they impose algorithms as they have on the website I write for, Truthdig. So impressions – you go into Google and you type a word like “imperialism.” If I had written a story on imperialism a year and half ago, it would have come up with any other recent article. Now it doesn’t. So referrals from impressions to Truthdig alone have over the last year declined from over 700,000 to below 200,000. Alternet’s traffic has dropped by 63 percent. World Socialist Web Site by 83 percent. Black Lives Matter. Any of these groups that are critics of the stated ruling ideology are targeted, and net neutrality is another weapon to tier the internet and marginalize them even further. There’s no question that it’s under way. I have a show on RT America because it’s the only place left where I can respectfully interview Mumia Abu-Jamal or interview David Harvey, the great Marxist economist, or Spenser Rapone, who was thrown out of the Army because he stood up for Kaepernick and declared himself a socialist. (RT America) is funded by the Russian government – I won’t pretend that it isn’t – but they’ve already targeted it. They’ve already managed to get RT off of the cable channels in New York state and California, and they’ll shut the whole thing down. It has nothing to do with Russian propaganda. It has to do with a relentless campaign to silence voices like mine. And they will. They’ll do it. J.Z. : Was there ever a time when we got it right? And what do we do about this? You’ve talked about taking to the streets in the past. C.H. : There’s never a time when we got it right. America was always created as a closed system. And it is radical movements that opened up the space in American democracy as Howard Zinn writes in “A People’s History of the United States.” The labor movement – we had hundreds of American workers murdered. We had the bloodiest, most violent labor wars in the industrialized world. The civil rights movement, the struggle of African-Americans for freedom, which they still don’t have. So we never got it right. J.Z. : It seemed like we were trying, though. C.H. : It was episodic. With the breakdown of capitalism in the 1930s, we created enough pressure on the oligarchic class that they responded. So Roosevelt created 12 million jobs. We had the movements in the 1960s. Out of that came the environmental movement, the feminist movement, and of course until the end of Vietnam War, the anti-war movement, which terrified the elites. The current period is from the early 1970s until now, with the collusion of the Democratic Party – in particular Bill Clinton, who sold out to corporate power, destroying welfare – and 70 percent of the original recipients of the welfare program were children. Our mass incarceration exploded from about 700,000 to 2 million. And he militarized the police and extended the length of sentences, because he and Joe Biden wanted to take back the law-and-order issue from Republicans. The destruction of Glass-Steagall, which ripped down the firewalls between commercial and investment banks, which precipitated the (financial crisis) – all of that was Clinton. So at that point, you didn’t have a functioning liberal class. You had a faux liberal class that spoke in the traditional “feel your pain” of liberalism but assiduously served corporate power. That’s Pelosi, that’s Schumer, that’s Obama and that’s Clinton. And at that point, we just lost any mechanism to get the centers of power to respond. Now the only thing we have left is to try and mobilize sustained civil disobedience in the hope that we can wrest power back from the hands of these corporations that are cannibalizing the country, further impoverishing and repressing the working class and the poor, and who are, in the name of short-term profit, destroying the ecosystem on which we depend for life. I mean, it’s really the gravest crisis in human history, and we’re all sitting in front of the TV talking about Brett Kavanaugh being drunk at Yale. J.Z. : So who are the leaders that you look to, or are there any? C.H. : I wouldn’t look to leaders. That’s kind of a mistake. You have to understand power before you can confront it. Education is a fundamental component to resistance because the ruling elites are never going to give you the information. You’ve got to go out and find it for yourself. All of the anarchists, communists, socialists, all of the radicals – we had a strong radical movement at the turn of the century, and they understood that. Sweatshop workers were spending 10 to 12 hours a day on the Lower East Side and then going to their study groups. That’s kind of why I teach in a prison. As my students say, it makes them kind of lonely because they can’t talk to anyone, who are spitting back these thought-terminating cliches that are fed to them on television screens. On the other hand, how power works, that is the prerequisite of becoming an effective opponent. But if you don’t understand how power works, you can’t oppose it.